It's been a couple of years since the conclusion to the tale of Shonen Jump’s favorite ninja darling, Uzumaki Naruto. During its epic run, fans of the hit manga and animé series consumed everything related to Naruto, from the dozens of animé episodes aired, streamed, and downloaded, to movies and merch, to the impressively rendered video games. The recent Naruto Shippuden: Ultimate Ninja Storm 4 is probably the final game we’ll get to play that focuses on Naruto’s story. Via its last DLC, Road to Boruto, Shippuden introduced us to Boruto, Naruto’s son and future Shonen Jump superstar. With Boruto stepping in to fill his father’s place in the spotlight, fans definitely needed a new game featuring our young ninja hero, but instead of just retracing their past steps (difficult to do since the early chapters of Boruto’s story are still unfolding), Bandai-Namco Entertainment, through developers Soleil and CyberConnect2, gave us something we weren’t expecting: an online multiplayer game set in the Naruto/Boruto universe starring you, the player! Naruto to Boruto: Shinobi Striker, at its very core, is an online multiplayer action game. The game starts off by letting you create your very own original character. 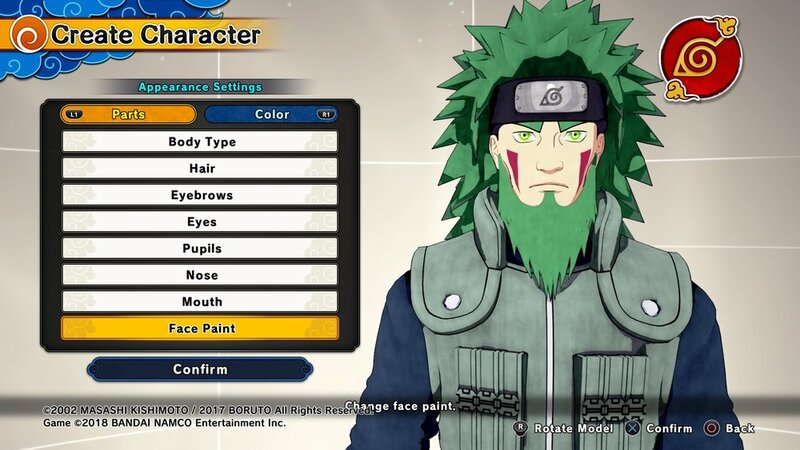 While Shinobi Striker gives you a fair if not limiting amount of cosmetic options for customization at the outset, the game gradually offers more options as you progress (more on that later). ﻿Once you’re done dressing up your shinobi, you’re transported to the game’s main hub, which resembles a district of Konoha, the Hidden Leaf Village where Naruto and most of the show’s beloved cast resides. Shinobi Striker then continues to give you a tour of the hub as well as teach you the basics of the game via “VR Training Missions”. Yes, The Naruto universe has caught up with our own boring real world to the point where Konoha has its own VR-powered Danger Room. ﻿Shinobi Striker’s VR Missions also hosts the game’s PvE content, which can be played solo or co-op with up to 3 friends/strangers. Plot-wise, the VR Training Room exists for ninja trainees to relive the story’s key battles and events, so some of the VR missions are loosely based on crucial moments in the animé. However, most if not all these missions follow the same formula, where you make your way from point A to B, fight a group of ninja grunts, head to another point, fight more grunts, then repeat until you get to the mission’s boss battle. There will be the occasional unique mission, but at this point during my time and experience with the game, I got too fed up with how mediocre and bland the VR Missions became. On the bright side, completing VR Missions will reward you with scrolls which you can bring to the Item Shop to be appraised and earn items. After a few missions in the VR Training area, Konohamaru tells you that you’re ready for the real deal! He tells you to go to the Seventh Hokage’s estate in the north part of the hub. From there, Boruto’s dad will personally greet you, and from here on out the game opens up and reveals its true focus: Online Battles. Is this really your ninja way? I can’t stress this enough - in case you’re hoping for a Naruto game similar to the DragonBall Xenoverse franchise that boasts a deep character customization system and a new plot focused on your original character... you’re not gonna get that here. Shinobi Striker is strictly about the online experience. The avatar you made is simply just that: a placeholder to represent you during multiplayer battles. There is no plot to supplement your ninja’s motivation or background. All you need to know is that you’re the new guy (or gal), and to be the best, you need to beat the rest, or, in this case, grind in online battles over and over! 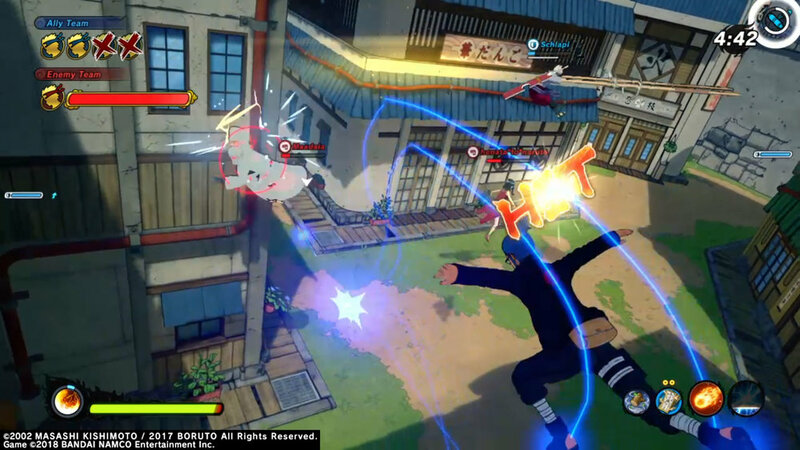 Players are offered two choices for multiplayer when you enter the Hokage’s Estate: Quick Match and Ninja League. Quick Match drops you into a random matchmaking lobby for some casual, non-ranked matches, while Ninja League games are ranked matches. Matches in Shinobi Striker are 4v4 team battles with four different modes, though the game’s designed to only allow a few of the modes available at random at any one time. So far Shinobi Striker offers: Combat Battle (a.k.a. classic Team Deathmatch, where you get points per knockout/kill and the team with the most points when the timer runs out wins), Capture the Flag (a race against the clock to nab the most flags from your opponent's’ base while defending yours), Point Capture (capture and defend three points on the map), and finally, Barrier Match (where your team’s objective is to remove seals/barriers and beat the opposing team’s boss while at the same time defending your own). VR Masters are based off the popular characters you know and love within the Naruto universe. Assigning a Master will grant you access to the signature items, costumes, and Jutsus that each Master owns or uses in the animé/manga. Want to dress up as Boruto’s dad and learn the awesome Rasengan to add to your arsenal of Jutsus? Pick Naruto as your VR Master! Wanna be a Range specialist, spam Chidoris, spit fireballs or just look cool (or/and edgy) throughout the game? Go with Sasuke, and if you change your mind, you can switch it up again. Every time you play a match and earn experience points, you’ll also earn EXP for your VR Master. Ranking up under your VR Master’s tutelage will net you those sweet signature rewards; the game nicely lets you peek at the ranking tree so you’ll know what new unlocks to expect. What’s also cool is that once you unlock a new VR Master via VR Training/Missions, you’d be able to select them in multiplayer matches! Finally, a platform where you can let a team of four Narutos fight four Sasukes is a dream no more. With all this said, is the game actually worth your time and money? Is the game actually fun? On paper, Shinobi Striker is a casual fast-paced online action game with light MOBA elements sprinkled on top. However, the game has its share of problems such as a wonky camera and target-lock system, a small pool of maps available at launch, uneven matchmaking that often pairs newbies up with high-level players, and a very problematic launch week due to bugs and crashes (which at the time of this review have been reportedly fixed). Hopefully this gets fixed in the future. However the biggest problems Shinobi Striker faces at the moment are how half-baked and incomplete the game is during its release window. Glaring design choices during launch week bordered on the ridiculous; we’re talking about decisions such as the absence of an “Exit Match” option in the multiplayer pause menu, no “Return to Lobby” or “Exit Match” button in the results screen after each match, no way of determining your teammates’ or opponent's’ connection via bar or ping symbols - a staple for online games - and no dedicated servers, just to name a few issues. The bit about the exclusion of “Exit Match” buttons on the results screen was the worst offender during launch week. Thanks to a few reports, the game doesn’t like low-connection (5mbps) modems. This leads to the infinite loading screen bug, where the game just hangs and sits on the loading screen because it’s configured to use your net connection to load itself onto the Bandai-Namco servers, instead of simply loading the game off disk to the next screen. So picture this scenario which happened during my time with the game: you just finished a game via Quick Match, and the results screen ends. This should lead you to the lobby/hub area. If you have good speeds, such as through a fiber connection, the game will normally load up the hub and you’ll be automatically placed in another matchmaking lobby which will be ready to load up the next game once the required eight players have joined. However, if you have a normal DSL connection or anything lower than a fiber connection, chances are the game will get stuck a bit on the loading screen after the results page of your previous match, but will still place you in another matchmaking lobby. So once that lobby fills up, it will basically load up the next match without your knowing it. Without any knowledge about the game’s problems with low-connection modems, my experience through week one was being stuck in ninja hell forever until I just closed the application. This wouldn’t have happened if the devs included a “Return to Hub/Lobby” button during the results screen, so I could just quit the match before the Results screen finishes its countdown. This is standard practice in most if not ALL online games. Even non-online games have means of quitting a match, so why would anyone want to not include it in this game? So, that’s pretty much the gist of what you can do and get out of Naruto to Boruto Shinobi Striker. From my time with the banal tutorials to spending hours in online matches, I would say that at this state, it’s disappointing that this Naruto game under-delivers on its fun factors, as well as any content that could prolong its longevity. Shinobi Striker is geared towards the PvP and PvE audience. You can pretty much brand it as a typical online game. We can only hope that constant content updates and a fresh and optimistic community will keep Shinobi Striker from getting stale too early. If you plan to buy this game, even if you are a die-hard fan of the Naruto and Boruto series, I would go so far as to suggest that you should wait a bit for all the bugs to disappear and for the devs to further improve and update the experience. Otherwise, go buy Ultimate Ninja Storm 4 instead to sate your ninja hunger. Played on: PlayStation 4 standard. Created two ninjas on two setups: one with a normal 5mbps DSL connection, and the other on a 50mbps fiber connection. Completed a few VR Training missions, both in solo and group with a random team. Spent 10+ hours in Quick Match and Ninja League, with an hour of that time spent on the loading screen.